As the gaming industry moves along, it continues to tackle adding the five senses to the medium. It’s now had motion control so precise, that we quickly grew bored of waving around our 1:1 virtual tennis rackets. The Oculus Rift is attempting to bring pseudo-VR to the household for a relatively cheap cost. Smell-o-vision, though it doesn’t exist as any kind of major (or minor) peripheral, has been successfully attempted here and there throughout the industry’s life in form of a unit that releases scented oils. The realm of taste has been thankfully left untouched. Though the industry has provided very basic tactile feedback via vibrating controllers and peripherals, there isn’t yet any device that allows us to really feel our games. 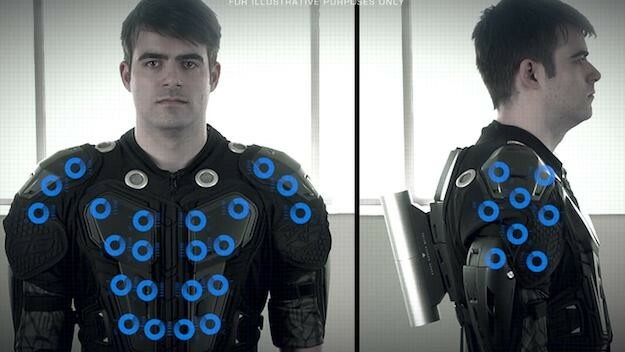 A new Kickstarter project, the ARAIG suit, is attempting to bring us those very feelings. The occasional haptic feedback suit has been attempted before — notably the Aura Interactor, essentially a subwoofer in a backpack — but the consumer market hasn’t been able to, for example, walk through the rain in a game and feel the patter of raindrops on their shoulders. The ARAIG — standing for the somewhat on-the-nose As Real As It Gets — suit aims to deliver a multi-sensory experience that a booming base in a backpack never could.